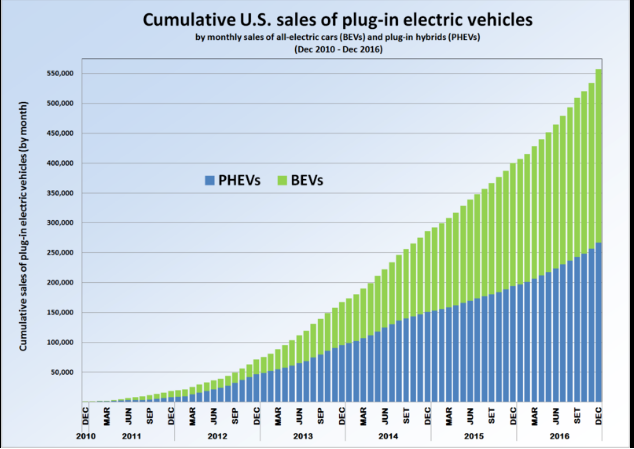 The electric vehicle market is experiencing massive growth, with the popularity of EVs such as the Chevrolet Volt, the Nissan Leaf, and the Tesla leading the charge. While gas-powered cars rely on one of the hundreds of thousands of gas stations across the nation for refueling their cars, most EV drivers currently use the home garage as their primary ‘refueling’ station. But as EV usage has become more widespread, EV drivers have demonstrated an interest in opportunistic charging prospects while driving their EVs instead of making a special trip to a refueling station. These opportunistic pit stops may come in the form of a shopping trip, grabbing lunch at a restaurant, or at work. As a result, owners of retail centers can see a chance to differentiate themselves, and gain a competitive advantage, by attracting these clean-driving candidates. If there is anything millennials appear to appreciate, it is the ability to multitask. If given the chance, millennials greatly appreciate the chance to knock out multiple chores at once, and a savvy retailer can capitalize on this to attract customers to their centers. As EV adoption becomes more commonplace, owners will elect to bring their businesses to locations with EV stations, so that millennials can knock out two chores at once. For retailers, malls, and retail developers, this consumer “linger factor” can lead to an increase in dollars spent per EV driver – especially if the competition does not have it. Beyond multitasking, there is a portion of the EV population that does not have convenient access to home charging. Many EV advocates argue we will charge our cars like we charge our phones: at night while we sleep, during the day while we work, and any other time when we don’t need to be moving. With housing trends pointing to a generational shift into multifamily housing over single-family homes, the availability of an outlet for overnight EV charging may not always be there for owners. As a result, day charging may be the only option available for incoming EV owners. With cars like the Nissan Leaf having a real-world range of around 80-miles, this means that EV chargers can, quite literally, drive traffic to a business and set them apart from local competition. While this all sounds appealing, some people prefer seeing the cold, hard numbers showing the financial benefit needed to make installation feasible. That is, how much would it cost to buy and install the EV station, what is the incremental monthly expense, and how much would I need to generate to make financial sense of this? As expected, this all depends on the size and type of your retail center. But the back-of-the-envelope numbers show it makes sense for the majority of retail centers. 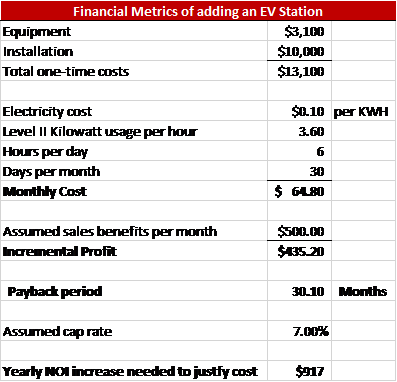 The numbers to the right show some sample metrics you may expect, and may want to consider, in assessing the financial feasibility of EV stations. Many of these systems allow the EV station to be shut off in non-operating hours, preventing electric costs when the retail center is not active. Assuming a 7% cap sales price and $13,100 in installation costs, you would have to increase your asset-level yearly overall NOI by $917 to break even financially in a capitalized sense. Different retail centers will find this reasonable to different degrees. But larger shopping centers with no EV stations should definitely take a good, hard look at adding one. These EV stations need no common maintenance, and are often provided with 36 to 60-month manufacturer warranties against all issues. Are you developing a new retail center? Consider allocating a portion of your blueprint to the infrastructure needed for an EV station. This would knock down installation costs tremendously, whenever you look to do it. 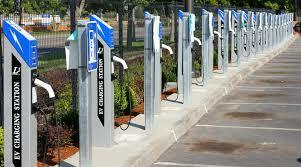 In conclusion, the adoption of EV stations to retail centers has been a slow process. Historically, in typical catch-22 fashion, people have been hesitant to buy EVs due to a lack of existing easy-to-access charging ports, and retailers have hesitated to install charging stations because they don’t feel there is a large enough daytime EV charging need to justify the costs. But as the popularity of electric vehicles has gone up, and the need for daytime charging stations has skyrocketed, it may make sense to add one of these gadgets to your retail center.